To those living outside of the 159,190 person city that is Eugene, Oregon, the name Marcus Mariota probably means very little. A dual-threat QB from the University of Oregon, Mariota and the Ducks offense were perennially entertaining to watch — unless they were playing your team, that is. Those outside Eugene probably know the QB is a highly touted NFL recruit, predicted to be drafted anywhere from first overall to the middle of the first round. Heck, maybe they even know Mariota finished with the second highest Passer Efficiency Rating (171.75) since they started recording the statistic in 1956 (via Sports Reference). Here’s what they don’t know: At every Duck home game, from September 1st, 2012, to November 22nd, 2014, more than 54,000 people crammed themselves into Autzen Stadium to watch #8. Eugene, a little hippie city in the southern Willamette Valley of Oregon, caught Hawaiian fever. 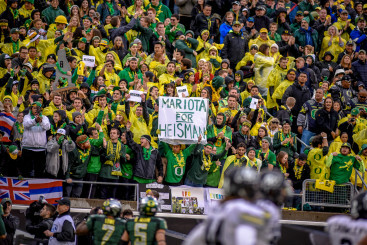 In three years, Mariota brought the city of Eugene three separate bowl victories, a National Championship berth, a combined 36-5 record, and a 105-14 TD:Int ratio. 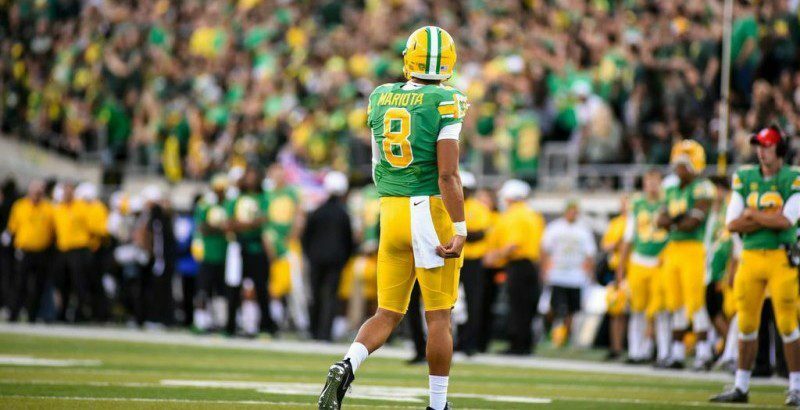 Mariota was everything to the city of Eugene and, although he’s wished all the best with his transition to the NFL, a void is left. Vernon Adams Jr. will not be considered. Although, yes, it appears everything is set for the Eastern Washington stud to transfer, he is not officially on campus yet. Adams will be a heavy favorite to win the job if and when he arrives, but until then the only QBs this article will be concerned with are those who are officially practicing during spring ball. 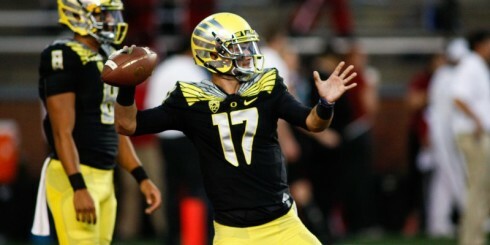 Any QB that starts for the Ducks will be great. 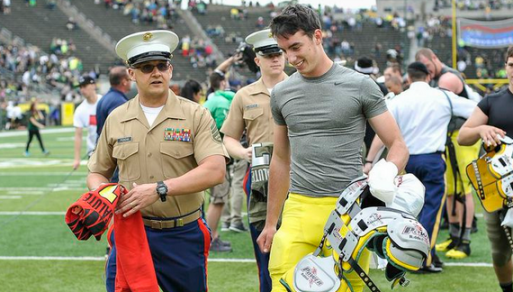 The Ducks are an upper tier-one school, and their QB depth chart reflects that. Just look at what Bryan Bennett, a former Ducks backup QB, accomplished when he switched schools to FCS Southeastern Louisiana. He was a backup at Oregon. 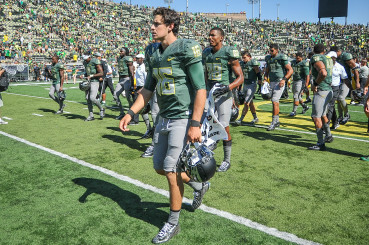 No one can say that any QB thrown into Oregon’s system will succeed. The Ducks offense is designed in a way that QB’s see great success, that much is true. However, it takes a special breed of QB to maximize the Oregon offense to its fullest potential. Mariota did just that, and his successor will be expected to do the same. For those counting at home, that’s five quarterbacks, not including Adams. For pure sanity, the list has to be narrowed a little. Alie is solid, but he’s a little undersized and is most likely the least plausible candidate. He will not be considered as a legitimate contender for the starting role. He will, however, remain on the depth chart as a candidate, and will certainly be given his shot in the spring. Other than Alie, everyone is fair game for consideration. Lockie, simply put, has been around the block. He was Mariota’s backup for two years; he’s matured with the receivers currently on the roster; he’s the only QB listed with real college experience; and he just has that veteran swagger to him. Although he didn’t get to see the field often, when presented the opportunity, he didn’t disappoint. Lockie connected on 21-28 passes (75%), accumulating 207 yards and a TD. He knows the offense much better than the other candidates, and he’s been around the locker room the longest. He might not have anything that screams “it factor” about him, but he can get the job done. With Royce Freeman returning, and Thomas Tyner finally healthy, that might be all the Ducks need. Mahalak received a four-star rating coming out of high school, much higher than Lockie’s two stars, so expectations are high. Mahalak redshirted all of last season, but now he’s officially ready to rumble. So what can he do? Ever heard of Ty Griffin? Don’t worry, you’re not alone. Griffin was a dual-threat QB who played for Georgia Tech and was all but guaranteed the starting job. Nevertheless, he packed his bags and transferred to Oregon, instead. As if the QB competition wasn’t deep enough already, Griffin gives Duck opponents just one more guy to worry about. Griffin is most dangerous when outside of the pocket, or when forced to run. In high school during his senior season, Griffin rushed for 1,149 yards and 19 TDs. Perhaps the Ducks could consider using Griffin in a wildcat package, but other than that, it’s a long shot for Griffin to win the starting nod. Griffin will, however, re-unite with younger brother Taj, a prospective running back, with both looking to make a splash come next fall. Travis Waller is great. He was a standout in high school, throwing for 3,361 yards and 26 TDs while also rushing for 2,133 yards and 26 TDs in his two years as the varsity starter. He deservingly earned a four-star grade and is a favorite to win the starting job at Oregon…in a couple years. Simply put, this is a tough year to be a freshman trying to win the starting job. The Ducks are too deep and too talented. Alie’s story is great, but he won’t be starting under center any time soon. There you have it, an in-depth look at the Oregon QB competition, and the candidates vying to replace Mariota. As mentioned above, once Adams is thrown into the mix, this is an entirely different conversation. Given so many candidates, could the Ducks try a look where they roll out different QB’s for different offensive packages? It’s not entirely out of the question. What can be said is that whoever does win the job will have 159,190 pairs of eyes watching him very closely. He has some big shoes to fill, after all!